I have met some of THE nicest people in this cardmaking, scrapbooking, mixed media world of ours. Bindy at Crafters Companion went out of her way to help me with something and then....she sends me happy mail! So I used that very happy mail to make her a card...like she doesn't get zillions of these already, but...maybe she is saving them to wallpaper a room with. Ya never know! 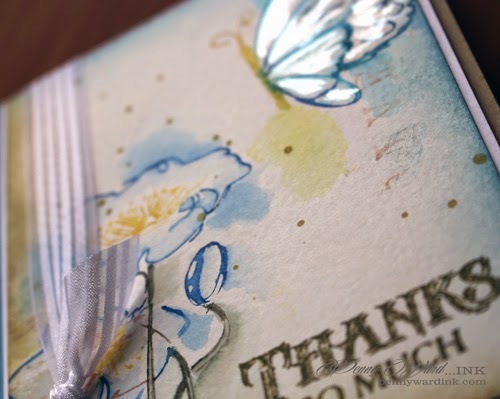 I stamped the flower and butterfly using Memento markers, then lightly touching the stamped ink with water. This is my first time using no actual watercolors, just the markers. I shimmered up (a new phrase of mine) the butterfly wings with a bit of water and Perfect Pearls. Thanks so much for stamping by...and Bindy...Fist Bump, High Five and you ROCK! Beautiful techniques on this card, it is lovely. 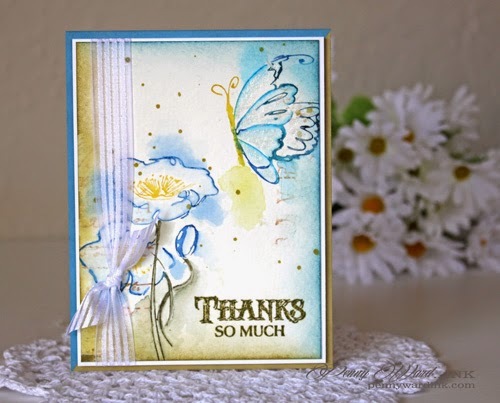 WOW - you did indeed shimmer up the wings of that butterfly, but you did not stop there - you added the "Penny made me" shimmer and flair to the WHOLE card!! Beautifully done and happy mail is the absolute best to receive - isn't it??? You are delight and I treasure seeing your marvelous creations on such a consistent basis!!! Have a lovely day, my friend!! If the rest of the world would treat each other the way stampers do, it would be a better place! Love the shimmery butterfly wings .. I am happy you received happy mail! !